I haven’t really been posting about my training for the BolderBoulder. I guess I was a little afraid of failure. I was afraid that I would have some sort of injury and not even make it to the start line much less the finish. 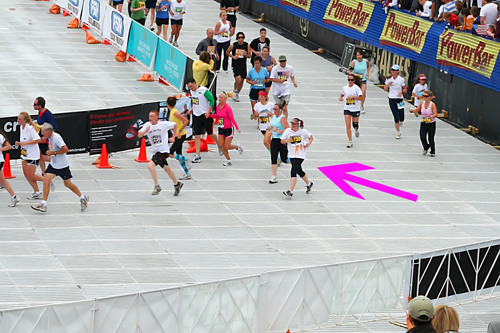 This was me today…rounding the bend to the finish line. My first 10K race since college. And I finished in 63 minutes and 34 seconds. You’re my hero! Great job chica! You completed a 10K, I can’t even spell it! this is exactly what i was hoping to see when i came here this morning. congrats my friend! i’m so proud of you! i promise next year i’ll be a half hour behind you! yay! HUGE CONGRATS heather, so proud of you! awesome time, you animal! i’m so proud of you! Have I been in a coma for practically TWO MONTHS? Have I been caught in some time warp stopping all time? Have I been just cast in a sequel of “Groundhog Day”? Have I been deleted from future Chindimples.com posts? Have I been patiently waiting to be brought up to speed with the completion of the remodel project? Are you making us all wait for the debut of the new show on HGTV, “Renovation Aggravation”? What gives? “W.T.F.” (Where’s The Finish) photos? Dad is right on the money (or in my head reading my thoughts)! I check every day to see if there is something new! Love you guys and miss you like crazy!